After the greatly successful Mr. O, here comes another batch of goofy gags crammed with little frames showing the mishaps of Mr. i, who, no matter what he tries, always ends up killed, poor fellah. You gotta love him, he’s a walking disaster. 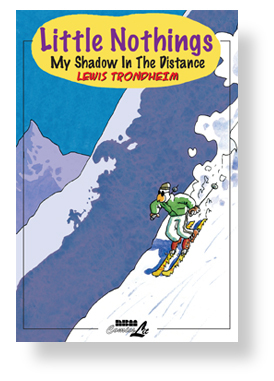 "My Shadow in the Distance"
"Recommended for those who appreciate low-key but charming autobiographical comics." "It’s funny, it’s charming as hell, and it’s almost painfully relatable." "So long as Trondheim continues creating work as strong as Uneasy Happiness, the comics world will be a bright place." "He’s self-deprecating without being mawkish, introspective without navel-gazing and consistently funny." "It’s smart and well-executed.We don’t really have anything else like this comic right now, not in North America, not someone this talented working this particular territory with such reliable clarity." More of the acclaimed comics blog musings of one of the greatest comic artists alive today, author of Dungeon, A.L.I.E.E.E.N. and Mr. O. The Onion called the first collection ‘a hoot’ and the Washington Post thought them “beautifully scribbled strips center[ing] on such existential hiccups as extreme self-doubt, spontaneous superstitions and unjustified paranoia.” You can see a preview of these comics blog entries on our site. "Trondheim appears determined to guarantee himself a place on everyone’s Best Of lists on an annual basis. Everything about the strips, the humor, the coloring, the observations about our cultural standards, is warm and inviting. Trondheim’s self-effacing wit remains strong. Little Nothings has become the most welcome, positive and anticipated book of the year. Trondheim’s established himself as one of the world’s great cartoonists, and this volume can only grow the legions of fans he’d earned around the world." "It’s breezy, delightful, makes the heart glad, and has nothing much more on its mind than drinking in everything around it. Little Nothings is composed of small moments that can at times seem apropos of, well, nothing, but that build into a compelling, quietly humorous, and satisfying series of observations. Trondheim’s brilliance as an artist is on full display, as he renders various settings in meticulous detail, retaining a fluidity largely created by an instinct for color choices that makes the art light yet grounded." "He’s hilarious and a master at framing small moments into punchlines. his style, depicting characters as anthropomorphic animals, is enormously expressive & clever. Trondheim is a master of connecting micronarratives and simultaneously embuing them with a wide range of emotional possibilities. He’s a born storyteller." The great talent behind the new generation in Europe, the Dungeon series, A.L.I.E.E.E.N. and Mr. O, pours his heart out in funny snippets of everyday life. His paranoia, little annoyances, big annoyances, chase of rainbows, love of comics, travel impressions from around the world, dealing with kids, being a kid: it’s all about life as we know it. A collection from his comics blog that expands his palette with full color painting, one can only be awed at Trondheim’s uncanny sense of observation and relate to all his experiences closely. Another touch of genius by one of today’s best and most influential comic artists. "They're at times cute, telling, hilarious, and transcendentand usually insightful. Well worth checking out. Whether you're laughing with him or cringing at him, odds are you can relate to him. ***1/2"
"One is left feeling comforted by the shared absurdities of life in the 21st century. A charmingly lighthearted stroll through life." "Really delightful  witty, astute, low-key, sweet, and polished, but never fussy. It’s also gorgeous. I just can’t say enough good things about this book. It’s charming, funny and sincere without being saccharine or remotely self-involved." "Trondheim’s art is typically beautiful. He’s taken his craft to a new level here. Highly recommended." "If the Curse of the Umbrella isn't the best thing that NBM has ever published in its 30 years of making graphic albums available to the English-language market, it's one of the top three. 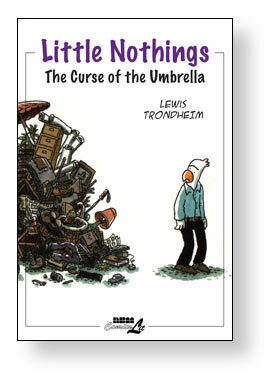 Moreover, it's the best showcase for Lewis Trondheim North American readers have yet encountered. these deceptively simple diary comics provide our first, full measure of one of the most important cartoonists of the last 25 years. It's the best new book I've read so far this year, and I can't imagine I'll read a half-dozen better than this one by next January 1. You should really buy it." 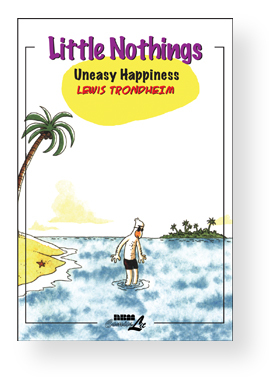 "Lewis Trondheim tells it honestly, without compulsion, without self-loathing. 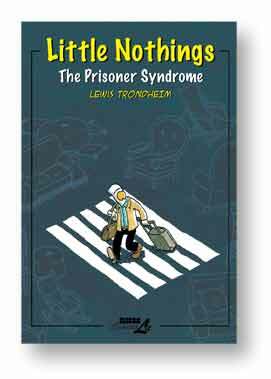 It is part of NBM’s Comicslit program, aiming to publish graphic novels about the human experience and Little Nothings is nothing if not that." "Beautifully scribbled strips center on such existential hiccups as extreme self-doubt, spontaneous superstitions and unjustified paranoia."